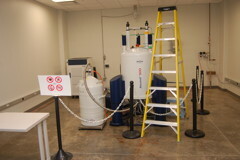 The Purdue Interdepartmental NMR Facility (PINMRF) provides access to state-of-the-art NMR techniques for Purdue University as well as for area businesses and technology parks. The Facility has spectrometers located in laboratories in four buildings on the Purdue campus. These spectrometers include nine solution-state machines ranging in field strength from 300 to 800 MHz and one 400 MHz wide-bore solids spectrometer. These spectrometers are able to perform the entire gamut of modern NMR techniques, and are used by researchers in Chemistry, Biochemistry, Medicinal Chemistry/Pharmacology, and other departments in areas as diverse as protein structure determination, organic chemistry support, and metabolomics. PINMRF uses software from iLab Solutions to assist with the management of our facility. You will need to have an account set up with iLabs using your Purdue credentials to allow you to log in to see the rest of the iLabs PINMRF website. To go to the PINMRF homepage at iLab, click here: iLab PINMRF Webpage. To go to the iLab kiosk webpage (to log your instrument usage), click here: iLab PINMRF Equipment Kiosk. If you would like more information about the Facility, or if you are planning to use the Facility's spectrometers, we have made up a reference document that we hope you will find useful. To view/download this document, please use this link: Overview Document. Copyright © 2006 - 2018 Purdue University, an equal access/equal opportunity university. Administrative Assistant at 765-494-7850 or the Director at 765-494-5287.